This image shows the partial solar eclipse’s path on July 1, 2011. The shades of red depict the eclipse's visibility. A Partial Solar Eclipse will take place on 1st July 2011. It will be 3rd Partial Solar Eclipse of the year, with one more partial solar eclipse due on 25th November 2011. Unfortunately this partial solar eclipse will not be visible for most of the world. This partial solar eclipse It will be visible in small area of south of Antarctica, and will not be visible in rest of the world including India, USA, UK, Australia. The last partial solar eclipse occurred just a month ago on 1st June 2011. A partial solar eclipse occurs when the moon’s shadow misses the earth but passes very close to it. The solar eclipse begins at 7:53 hrs UTC (Universal Time) and ends at 9.23 hrs. 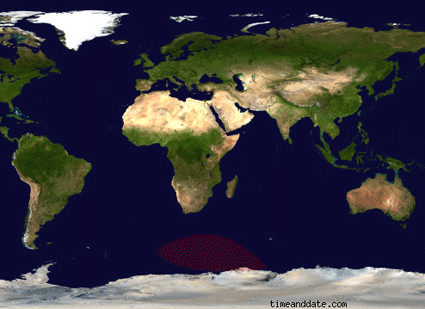 The greatest eclipse will occur at 8.39 hrs UTC. Note : 1st July 2011 Solar Eclipse / Surya Grahan will not be visible in India and other parts of the world so it wont have any astrological effect on us. Such eclipses which are not visible in any part of the world where people live, are rare.